We all know that fire is one of the oldest and most powerful tools that humans have. For millennia, we have used fire to improve our home lives—food, winter warmth, etc.—but what we often forget is that most of the landscapes we know and love have also been shaped by fire, and in many cases, by fires that humans have started. We both grew up in rural northern California, and if you talk to old timers in our communities, you'll hear stories of the deep connections between people and fire: of Native Americans lighting off of trails as they hiked out of their hunting grounds in the fall, and ranchers burning their fields to improve range and keep things open. Unfortunately, across much of California, these types of stories have become mere folklore—wistful anecdotes from a time with less regulation and more personal and cultural autonomy. In most parts of the state, landowners aren't using fire anymore; the fear of liability, the perceived complexity of permits and regulations, and the generational and cultural gaps in fire experience have virtually eliminated fire from the toolbox for most landowners. But that's about to change. For many years, we at University of California Cooperative Extension have fielded questions from landowners about using fire as a tool. Ranchers and forestland owners here in Humboldt County have voiced interest in using fire to improve range resources, enhance wildlife habitat, reduce fuels, and beat back the trees and shrubs that are quickly engulfing their prairies and woodlands, but we have struggled to provide them with good options. In recent history, CAL FIRE has been the leader in private lands burning. In the 1980s, their Vegetation Management Program (VMP) was responsible for 30,000-65,000 acres of prescribed burning every year, but in recent decades, those numbers have consistently fallen short of 10,000 acres a year—a drop in the bucket given the habitat and fuels issues that we face in California. CAL FIRE is currently revamping and reinvesting in the VMP, which is great news, but it's become clear that other pathways are needed for landowners to reclaim fire as the important tool that it is. Last year, we started looking into prescribed fire models from other parts of the country. We know that other regions have impressive burn programs that blow California out of the water, and in most of those places, they've been successful because landowners are doing the burning themselves—something that's almost unheard of in California. We were curious how those efforts are structured, and what it would take to do something similar here. One of the most promising models of landowner-led burning is the prescribed burn association (PBA) model, through which landowners and other interested partners can work together to burn each other's properties. In many regions, these PBAs are spearheaded by the ranching community, in collaboration with conservation organizations like the National Wild Turkey Federation, Pheasants Forever, and others that see direct benefits for wildlife. In 2015, there were 62 PBAs in the United States, almost all of which were in the Great Plains and Texas. The PBA model has spread into parts of the Southeast, too, but these types of efforts have been noticeably absent in the West. In March of 2017, we traveled to Nebraska to burn with and learn from two well-established PBAs. Our Californian convoy included the two of us from UCCE, a colleague from the Natural Resources Conservation Service, and Dean Hunt, one of our key ranching partners here in Humboldt County. During our five-day visit, we spent two days burning with the PBAs and learning about their organizational structure. In both cases, the PBAs have local leaders who are not traditional fire practitioners; rather, they are local landowners—one a corn farmer and the other a cattle rancher—who have a vested interest in healthy rangelands and habitats. Throughout the year, these PBA leaders work with other local landowners to develop burn plans and prep units, and when optimal weather windows present themselves, the group gets together and conducts the burns. The PBA is mostly volunteer, and members contribute tools and equipment to help make the burns happen. On the two days that we burned with them, an email was sent out to the PBA mailing list, and within hours, more than forty people arrived on site with trucks, UTVs equipped with small water tanks, and hand tools. The PBA leaders also have burn trailers, which were funded by various conservation groups and are fully equipped with hand tools, radios, drip torches, and other key items. PBA members typically volunteer on two or more burns before their projects make it onto the group's priority list. In this way, there is clear incentive to help each other out, and everyone benefits in the long term. Because of PBAs, burning has become a viable and effective treatment—one that provides unprecedented training opportunities to landowners, encourages community-wide collaboration, and is reversing trends of habitat and rangeland losses throughout the middle of the country. So why aren't we doing this in California? When we got back from Nebraska, we hit the ground running. 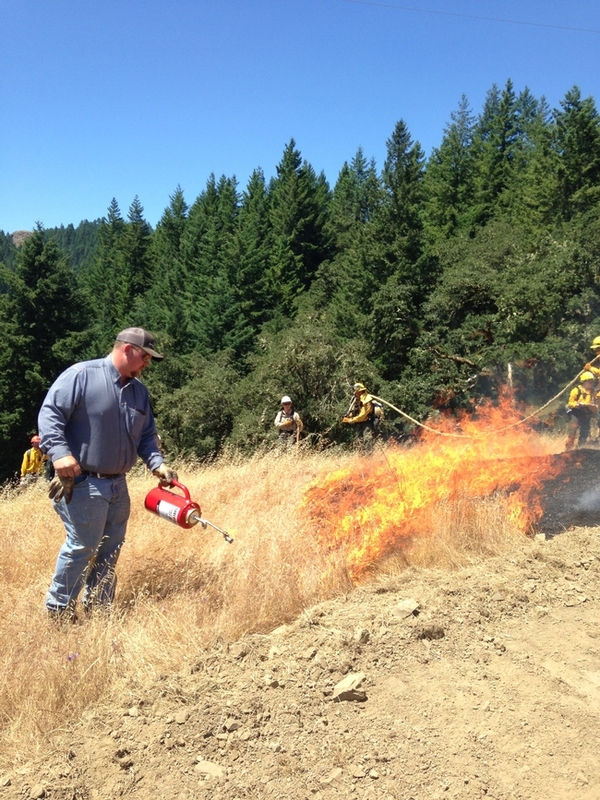 We organized a training burn on Dean Hunt's ranch that June, and we've completed another eight burns since then. Burns have targeted a wide range of objectives, including invasive species control, oak woodland restoration, coyote brush management, and fuels reduction. In March of this year, we held a meeting and officially formed the Humboldt County Prescribed Burn Association—the first of its kind in the West. At that meeting, we easily brainstormed 17 different projects that we'd like to complete in the coming year or two, and we formed an 11-person Board of Directors that includes a wide array of ranchers and other community members. Since then, we've applied for two grants and continued to build out our burn trailer, which was funded by the California Deer Association last year and is full of drip torches, hand tools, and other equipment for burning. On August 1, we hosted a workshop with Stephanie Larson and other partners. The workshop covered some of the nuts and bolts of prescribed fire on private lands in California, and it gave us a chance to share more information about prescribed burn associations. For more information on prescribed burning, please send us an email: Lenya Quinn-Davidson, Area Fire Advisor, UCCE, lquinndavidson@ucanr.edu, and Jeffery Stackhouse, Livestock and Natural Resources Advisor, UCCE, jwstackhouse@ucanr.edu.